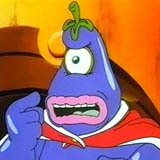 Eggplant Wizard, voiced by Michael Dovovan III, goes together with King Hippo as the idiotic duo. They both serve Mother Brain and both constantly bungle up the tasks upon which they are sent. Mother Brain even kicks them out of her service at one point for their stupidity.